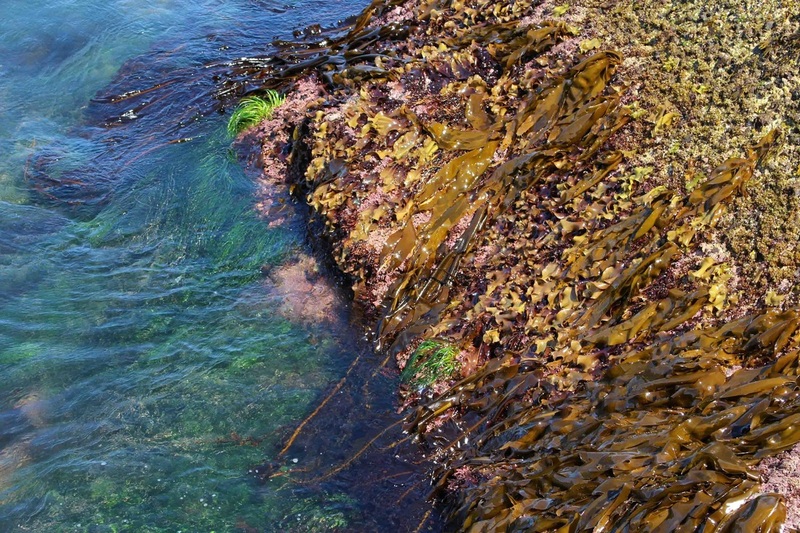 Top left: ribbon kelp attached to rocks in the intertidal. Photo by John Reynolds. 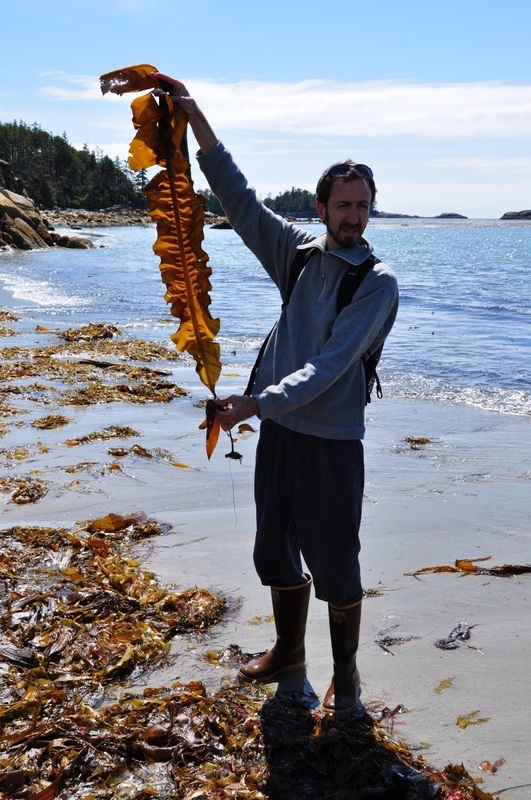 Bottom left: Dr. Patrick Martone discusses ribbon kelp with a class at the Hakai Institute on Calvert Island. Photo by Brian Starzomski. Right: an excellent example of the wing-shaped sporophylls for which the species gained the common name "winged kelp." Photo by Jenn Burt. Ribbon kelp is named for having conspicuous wing-shaped reproductive blades (sporophylls) near its base. 20-40 of these sporophylls form two rows along the upper part of the stipe below the blade. The stipe is less than 15 cm long. The blade is lance-shaped, grows to 3 m long, and has a single thick rib along its midline. The holdfast is branched and well-developed. Ribbon kelp grows in the mid to low intertidal, and sometimes subtidal. It is found from Kodiak Island, Alaska to Point Conception, California. 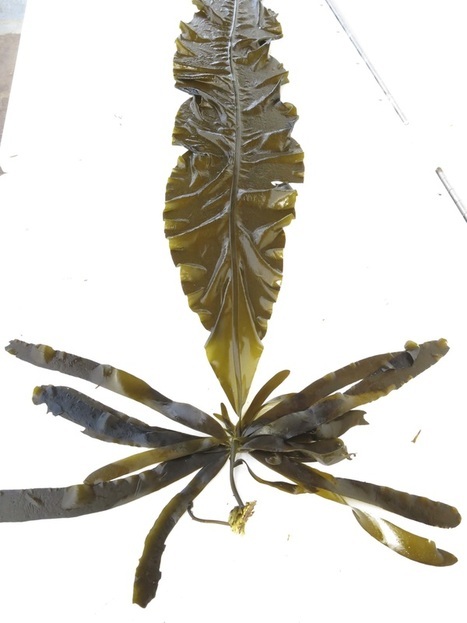 Harvest delicious ribbon kelp in late spring to early summer by removing the top end of the frond, and leaving the lower half of the kelp including the sporophylls so the frond still has reproductive potential. Air dry the seaweed at home, and chop up for use in stir-fries, or use large pieces as tortillas. This species is a good source of vitamins K and B6, as well as iodine and protein (if harvested in good condition). The Victoria BC-based publication EAT discussed Alaria harvesting in its Spring 2012 issue, available online. Ribbon kelp is considered an annual as its blades and sporophylls erode by the end of the summer, leaving only the holdfast and stipe which can overwinter but will rarely regrow. The sporophylls contain chemicals that discourage browsing by herbivores, meaning any browsing on this seaweed usually leaves the reproductive portion still viable. Sitka black tailed deer have been observed grazing on ribbon kelp when large snowfalls force them to feed in the intertidal zone. 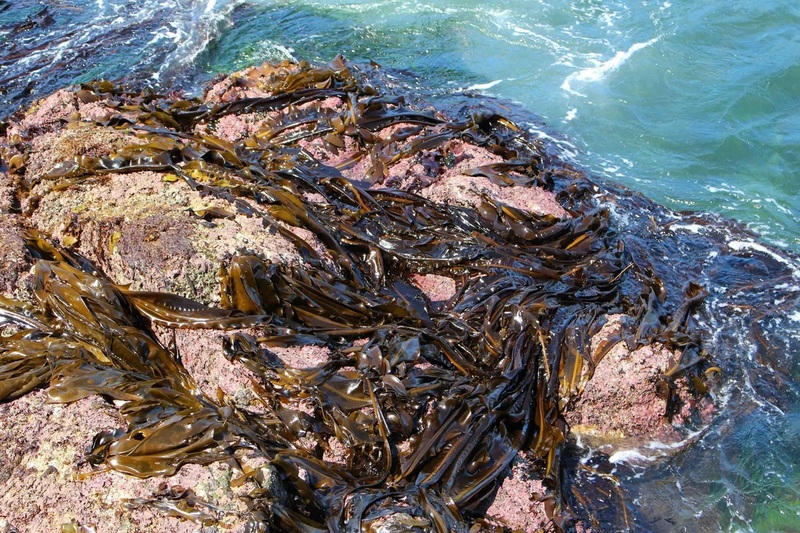 The dark brown colour of ribbon kelp helps identify it from other brown seaweeds in these images by Sara Wickham. Its thick, lighter-coloured midrib is also visible. It is the dominant species in the left-hand photo, while in the right-hand photo it is visible at the top and bottom of the image, draping from the lower edge of the rock into the water. Garza, D. 2012. 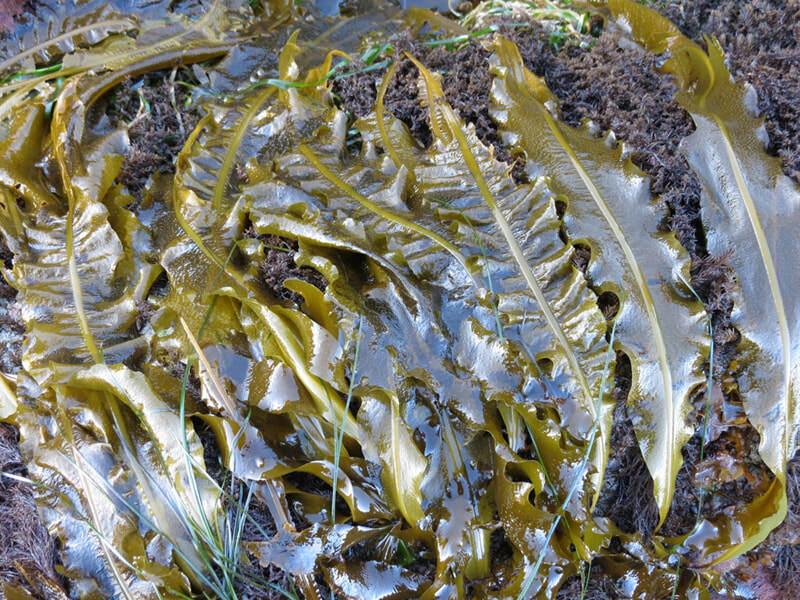 Common Edible Seaweeds in the Gulf of Alaska. Alaska Sea Grant Program, Alaska. P. 8-10. Lane, C.E., Lindstrom, S.C. & Saunders, G.W. (2007). A molecular assessment of northeast Pacific Alaria species (Laminariales, Phaeophyceae) with reference to the utility of DNA barcoding . Molecular Phylogenetics and Evolution 44: 634-648. O'Clair, R. and Lindstrom, S. Alaria marginata Postels et Ruprecht. In Klinkenberg, Brian. (Ed.). E-Flora BC: Electronic Atlas of the Plants of British Columbia. Lab for Advanced Spatial Analysis, Department of Geography, University of British Columbia, Vancouver. Accessed 14/07/2014. O'Clair, R. and Lindstrom, S. Eualaria fistulosa (Postels et Ruprecht) M.J. Wynne. In Klinkenberg, Brian. (Ed.). E-Flora BC: Electronic Atlas of the Plants of British Columbia. Lab for Advanced Spatial Analysis, Department of Geography, University of British Columbia, Vancouver. Accessed 14/07/2014.